Lockheed Martin (NYSE: LMT) has been awarded a four-year, $133.4 million contract modification by the U.S. Air Force to provide a stretch version of the C-130J Super Hercules airlifter to France. Lockheed’s aeronautics business will build C-130J-30 aircraft for the French military at a company facility in Marietta, Georgia, and is scheduled to finish work by Aug. 30, 2020, the Defense Department said Thursday. The Air Force Life Cycle Management Center is the contracting activity and obligated the full amount of the modification from foreign military sales France funds. 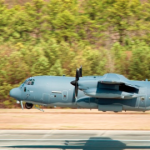 France ordered two Lockheed-built C130J transport planes and two KC-130J tankers from the U.S. government under a $650 million FMS agreement the State Department approved in November 2015.